I look forward to summer vacation every year. I enjoy the warm sunny days, trips to the beach, backyard barbecues and being able to spend more time with my two daughters. However, there’s one aspect of summer that I really don’t like: the extra work on my shoulders. I’m a bit of a neat freak and thrive on organization. My nerves get just a little frazzled when things are out of place and I can’t rest until the mess is picked up. My girls are good for helping out with a bit of coaxing, but I notice that I’m cleaning 10x more when school is out. This mom needs a break too! On the hot days, they want to spend time outside enjoying the nice weather. They both love swimming in my parent’s pool and Bridget likes to jump on the trampoline in our backyard. On those days, it’s a little easier to keep the house neat. 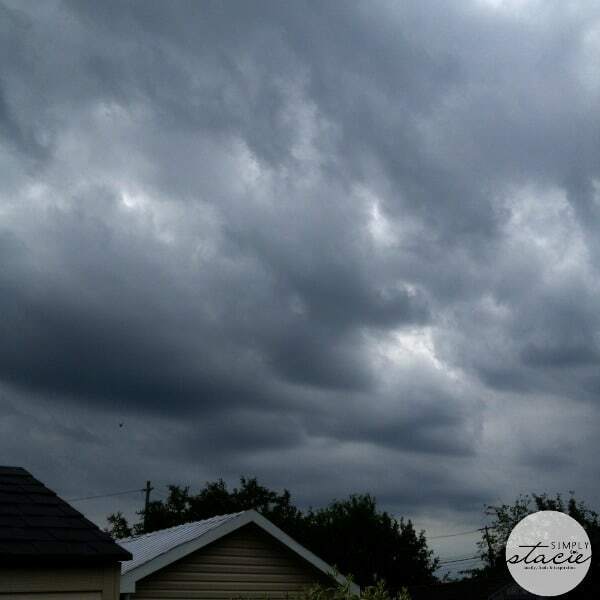 On the rainy days….well, that’s a whole other story! The kids are cooped up inside and it seems all of Bridget’s toys are strewn all over the house. Tell me I’m not the only one this happens to! This summer, Merry Maids, the expert in home cleaning, wants moms to enjoy the summer and not spend so much time cleaning up those notorious kid-made messes. They hope to inspire moms to take a much needed Mom-Cation Moment so we can all enjoy a carefree and relaxing summer too! Debra Johnson, a Merry Maids home cleaning expert has developed tips on how to take ” The Summer Mom-Cation”, a moment where moms get some cleaning help from the kids so they can relax a little and enjoy. I was SO ready for a Mom-Cation. How about you? It was raining here earlier this week with a risk of a thunderstorm so I knew there was no way Bridget would be going outside to play. 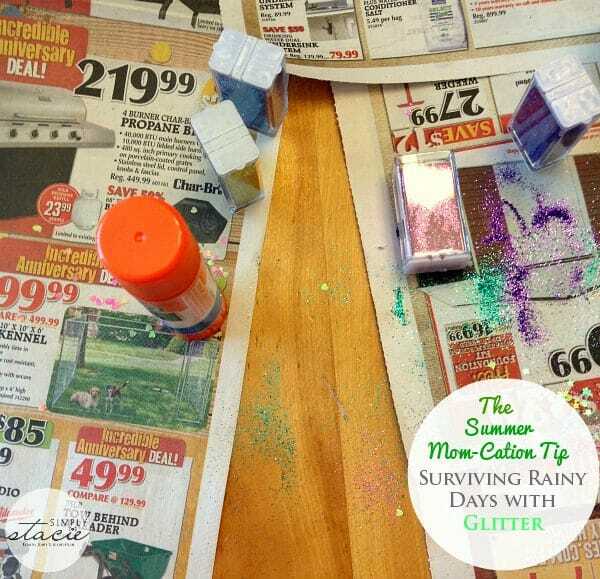 She was complaining she was bored so I knew it was a good time to try one of Merry Maid’s “The Summer Mom-Cation” Tips: how to survive a rainy day with glitter. 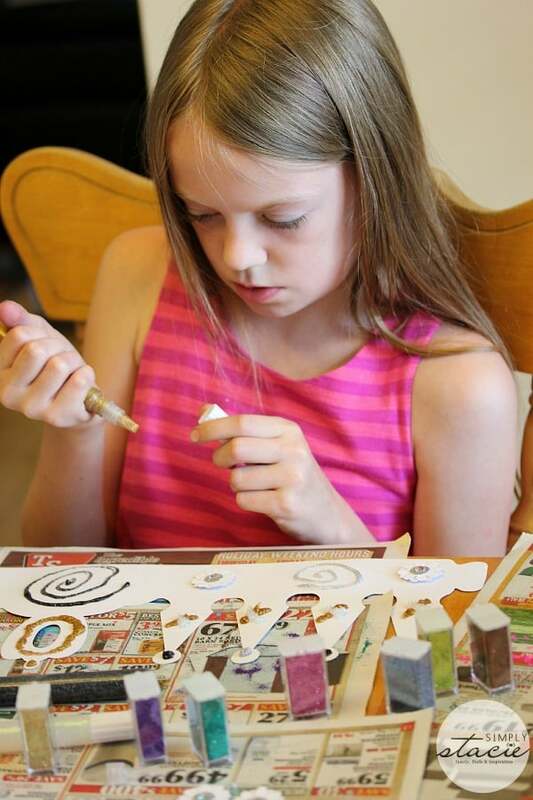 Bridget adores arts & crafts and can spend hours creating her “works of art”. 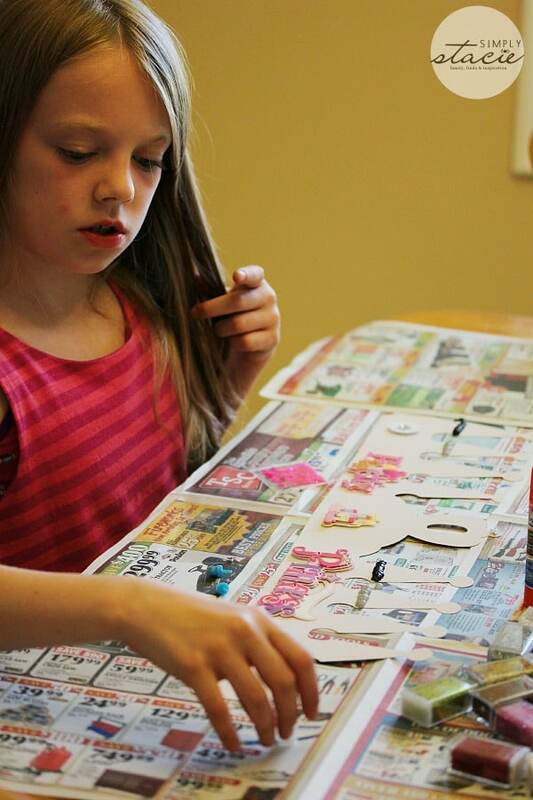 She loves making projects and then giving them as a gift to both family and friends. I’ll admit that I dread when she pulls out her glitter art set because I know how messy it will be. Glitter is notoriously difficult to clean up. It gets everywhere! Cleaning up glitter doesn’t have to be such a pain though. 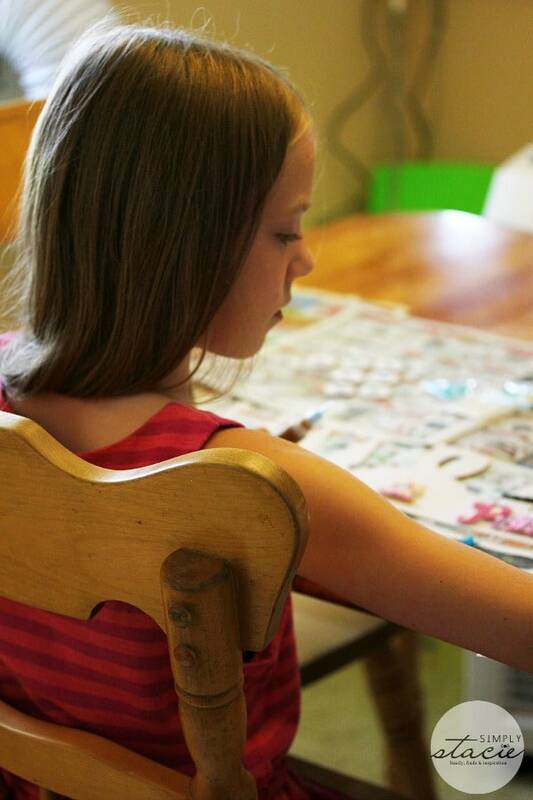 Debra has some simple solutions to make this rainy day craft less stressful! 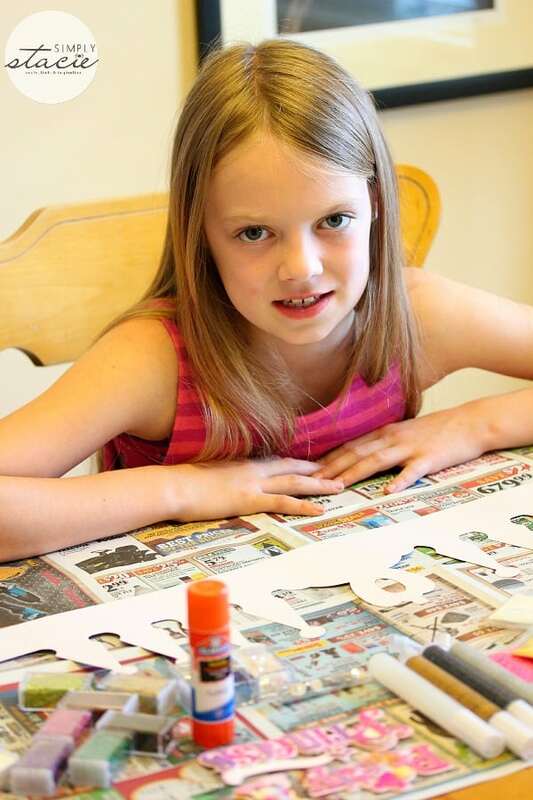 She recommends spreading paper or plastic over the table before starting a glitter craft project (or any type of craft project for that matter). This way most of the mess will stay on the paper. It’s inevitable that some will get on the table though! 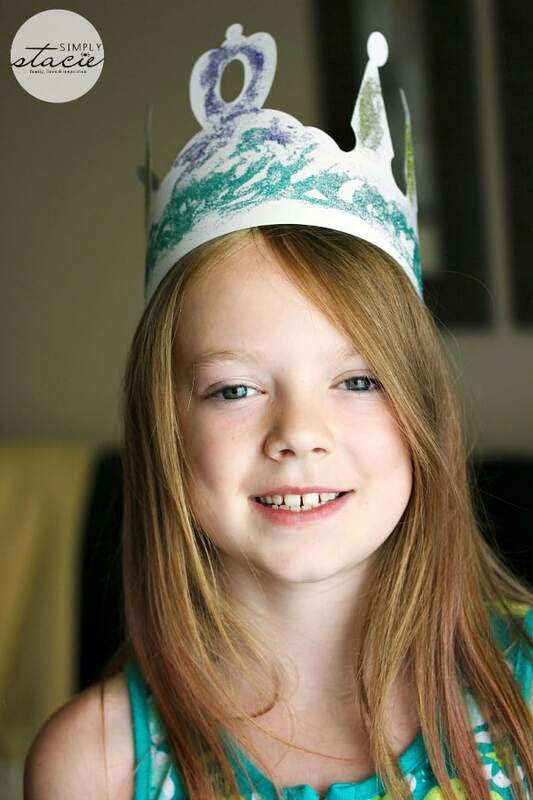 Bridget had some cut-out paper crowns and thought it would be fitting to decorate them with glittery “jewels”. 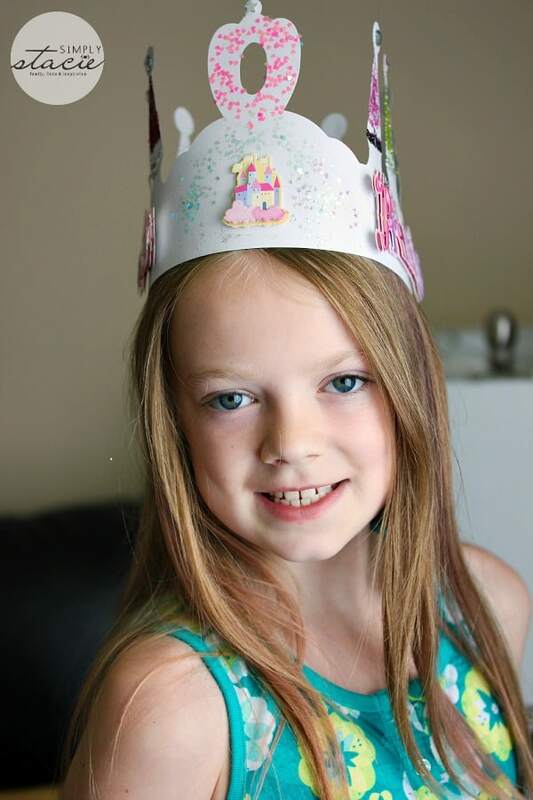 She wanted to make crowns for her own dress-up collection as well as give one to her six year old cousin, Avery. 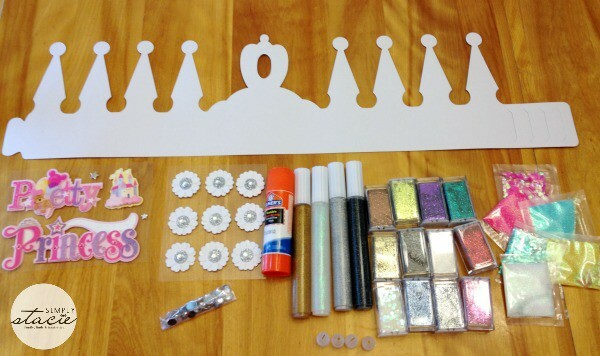 She spent a good hour creating her crowns and she didn’t do too bad with keeping the glitter contained. There was some spillage on the table and the chair where she was sitting and her little hands were full of glitter and glue. While the glue on her crowns were drying, I used Merry Maid’s tip to make it a Mom-Cation Moment. I enlisted Bridget’s help in cleaning up her glittery mess and explained what she had to do. Surprisingly she was enthusiastic about it. The tip is quite simple and only requires one item that you probably have in your home right now: tape! 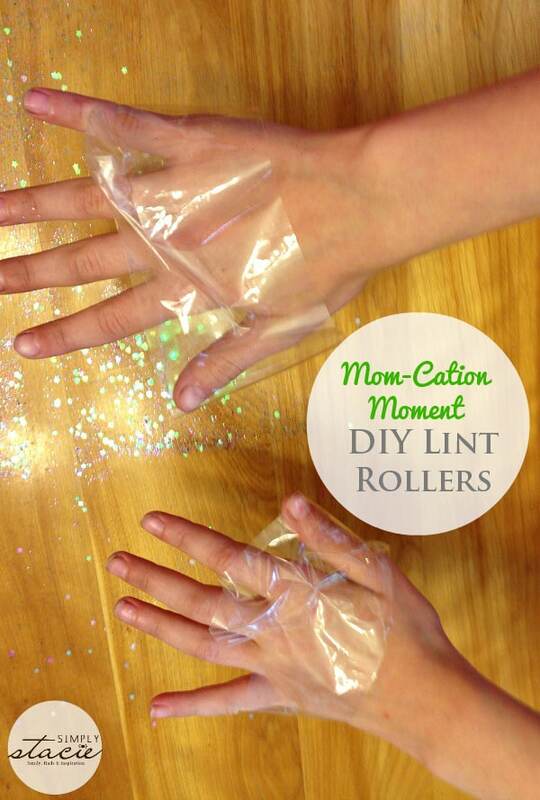 Make it a Mom-Cation Moment with these DIY lint rollers using a loop of tape wrapped around the child’s hands with the sticky side facing outward. 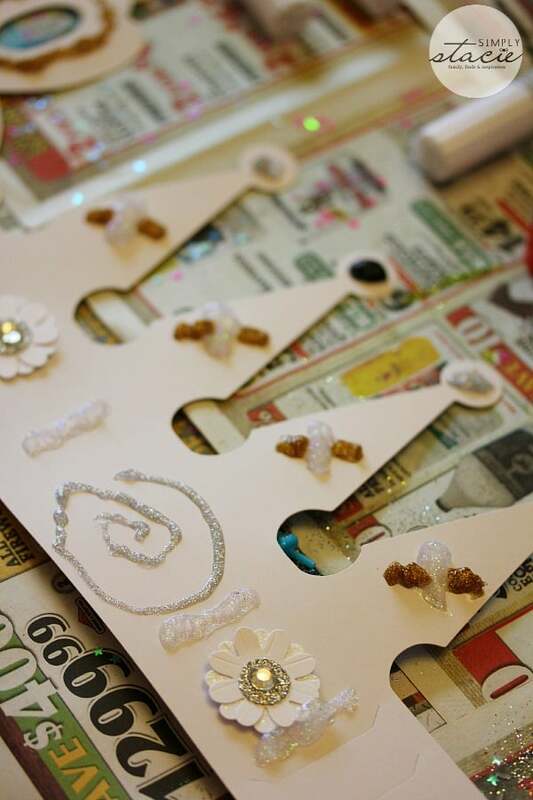 Then just have him or her tap the sparkly surfaces and capture any remaining glitter that was left behind. I told you it was easy and pretty smart too. Bridget did a fabulous job cleaning up the entire kitchen table and chair. Her lint rollers were completely full when she was finished. She then asked if we could do it again. I thought she meant make another crown, but she said she meant clean up the mess again! 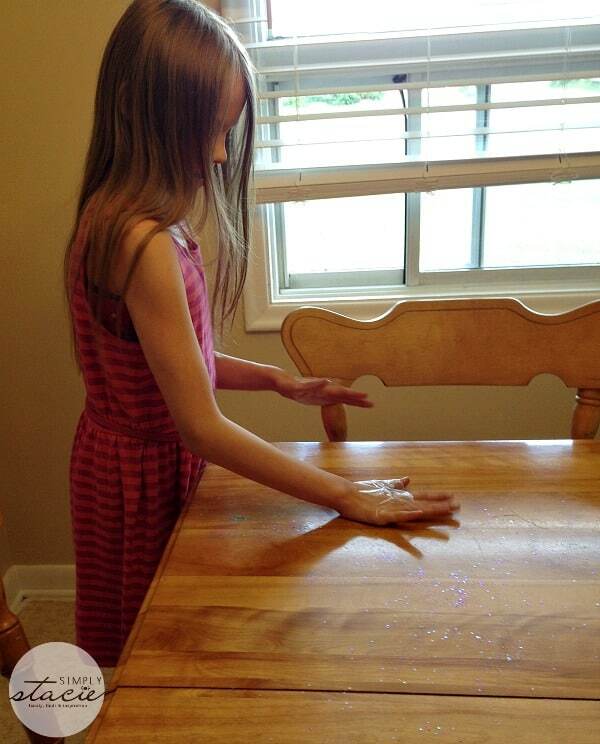 She wanted me to pour glitter on the table so she could pick it up. I told her we’ll do more glitter crafts another day. I’m glad to see she took an interest in helping clean up her mess though. Well done Bridget! It was nice to sit and enjoy a Mom-Cation Moment with a cup of coffee while Bridget took care of the clean-up. I need definitely need more of them! And didn’t she do a great job with her sparkly crowns? Merry Maids hopes that moms and fans will share their own cleaning tips and their best “Mom-Cation” Moments on the Merry Maid’s Facebook page using the hashtag #MomCation. Make sure you also check back for fun contests they’ll be hosting throughout the summer. I’ll be sharing more of “The Summer Mom-Cation” Tips shortly too! What are some of the kid-made messes that you dread cleaning up in the summer months? loved craft days with the girls except for the mess and yes glitter everywhere, that is an awesome idea with the tape, wished I knew about that trick when my girls were younger, sure would of helped!! i need a mom-cation badly!! can i go with you?? Lol its tough being a mommy, you never get a break!!! I was never too good at crafts, but some ideas I see not on the internet and Pinterest are very intriguing. The paper idea for the glitter is a great idea!! Thats awesome, looks like a blast!! Crafts are so much fun! It is hard yo keep them busy.Making spacific cookies and get them to decorate them and ask them to do the best job they can. It took my daughter and her friend 1 1/2 hr. They came out great. What a cute project! Hours of fun for her and tomorrow she could play make believe and be a sparkling princess. Love the tip on tape to clean u. Makes cleaning fun too. 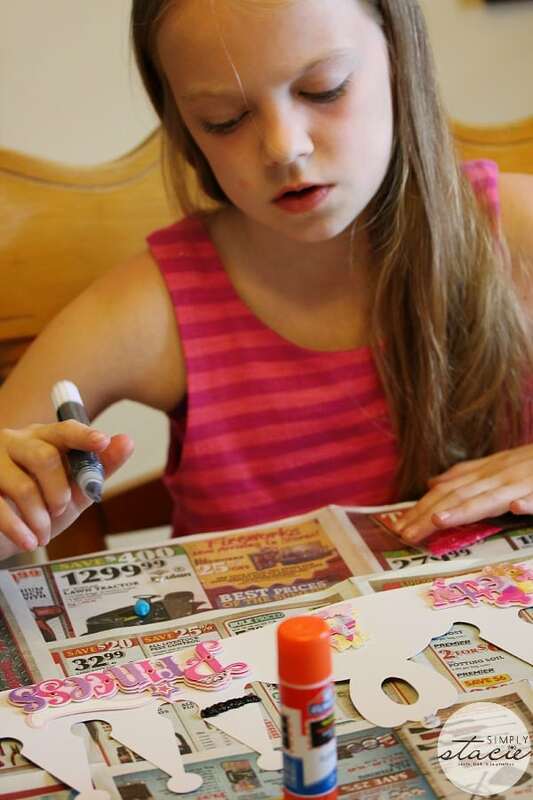 I have my grandkids for one week each summer and the crafts where we cut cardboard leaves cardboard slivers all over but the hardest thing for me was last year we got colored bubbles. Fun right…yes, except they stained our patio and the clothes. Love the tape idea to pick up the glitter! I do use plastic on my desk/table when working with glitter but it always gets places where it doesn’t need to be! 🙂 So this way of picking it up is faster and easier!! A kid-made mess that O dread cleaning up is when the kids write on the walls, especially in permanent marker, yikes!! 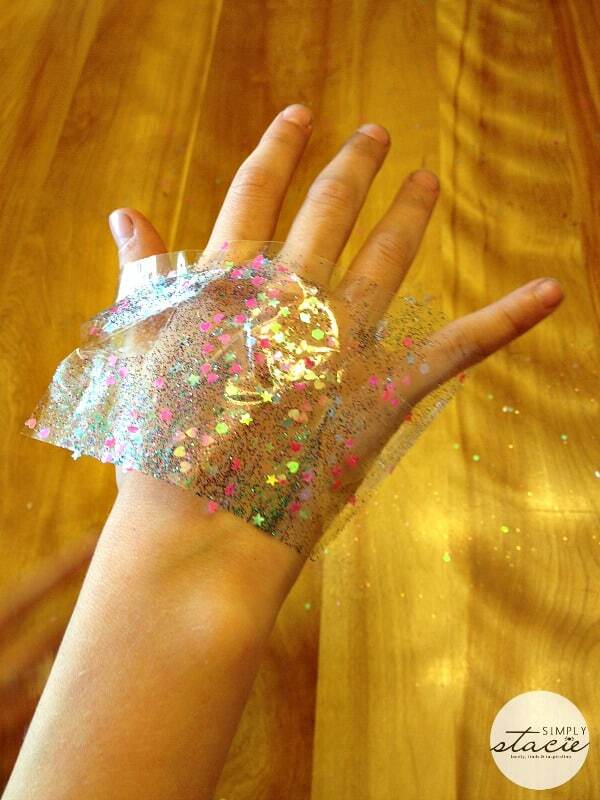 Playing with glitter is always fun, thank you for sharing this post. Glitter crafts are so much fun! Doing crafts with my child is sweet! My Grand Daughter loves to bake. With her we make cakes, cupcakes and cookies. She loves sweets. Not a lot, jut some, so we bake. The clean up use to be a challenge. So we played a little game. (Except for the glassware, I would put in pretty warm water, not super HOT. Lots of bubbles. We pulled a chair up to the sink, and she would do dishes. We would let them sit for a few minutes between sink loads. Then we would play bubble tag. I taught her to just take a small amount of bubbles, and she would chase me, I would take a few and chase her. She went home, asked her mom if she could do dishes. Her mom immediately called me, and asked why I was making her daughter do dishes. I explained what we would do. I said why for the rest of here life should she hate housework. It is a fact of life, so put a little fun into it when you can. I said treats, and a bit of fun, and the house is clean, and you are both happy. It’s a win-win! To this day, she loves cleaning! It is difficult to keep children from getting bored when the weather’s bad during the long summer break. Love the clean-up idea with the tape, certainly makes the job more interesting and easier. Looks like your daughter really enjoyed herself.